Hi. I'm Fran. 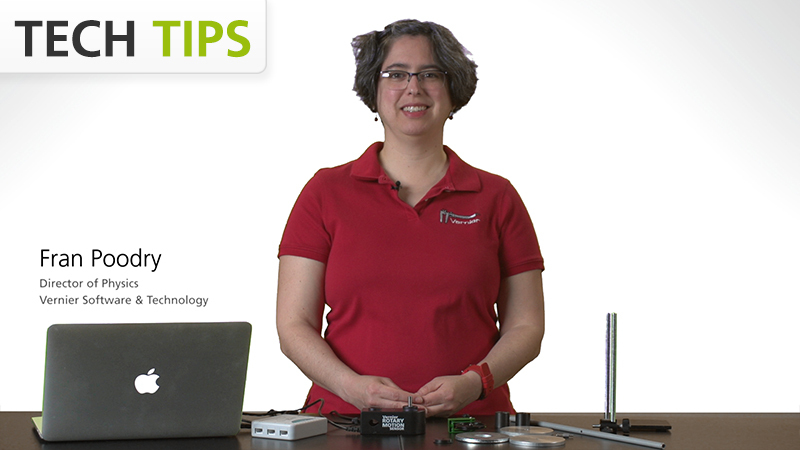 I'm here to talk to you about Vernier's rotary motion sensor, which is a versatile, little digital sensor that will let you measure rotation in a variety of units - degrees, radians, revolutions. It also has a couple of different settings, so you can do either the one-degree resolution or quarter of a degree resolution, so I'll set that up here on Logger Pro. So the X4, that means the quarter of a degree resolution. You have a limit of seven and a half revolutions per second at that. If I turn that off, then I now have at one-degree resolution, and I have up to 30 revolutions per second of angular velocity that I can measure. The rotary motion sensor has a wonderful user manual, which is available online at www.vernier.com. I do urge you to look at it. It's going to have a bunch of pictures. It shows you how to put things together. But in today's video, I'd like to show you some things that are a little bit unclear. Because a still photo can only show you so much, especially when it's a little on the small side. We're going to put the ultra-pulley onto the rotary motion sensor, and we're going to attach some of the attachments from the Rotary Motion Accessory Kit. The first thing that I want to attach is the pulley, and I'm going to need to do that with this piece here, which comes with the Rotary Motion Accessory Kit. It attaches at this point. I add the pulley, and then I have the three-step pulley that comes with the rotary motion sensor, so I'm going to attach that as well. What I'd like to do is have a string with a mass hanging off of it that's wrapped around the rotary motion sensor, and then goes over this pulley so that that mass can provide a torque for turning the sensor. Now, I'm going to use this piece of yellow string to mark this, and right now I'm not going to be able to do that effectively because the two pulleys are not lined up appropriately. So that's why I have this swivel attachment. I'm going to move that around, and see if I can get that... Oh, it looks like I went not quite far enough here. Almost. And there we are. Now I know that if I have a mass on a string that goes over this pulley, it's going to not only stay on the pulley but provide a nice tangential torque in the positive or counterclockwise direction on my sensor. So you're going to want to put various attachments on here. For example, to find the moment of inertia of a point particle, you're going to use this accessory rod. For that, you'll need this screw with its collar or sleeve. Put that together. I can just use my fingers to tighten it up, and then I can place my point masses on the rod. Now, using my string going over the ultra-pulley, I'm able to measure the rotational acceleration. In addition to the accessory rod, we also have some aluminum disks. They go on the same way with the screw and the collar. With this, you can determine the moment of inertia of a disk. You can also examine conservation of angular momentum by starting this going, and doubling the moment of inertia by dropping the second disk on and looking at the change in angular velocity. Finally, you might be wondering how to attach the steel washer, since the hole is much too large for the screw and that can wobble around. So we've provided a little disk that is much like, for those of you old enough to remember, the spacer to attach your 45-RPM record to your LP record player. That will then securely center and hold that steel washer. And There you have it. Once again, I encourage you to look at the user manual online at www.vernier.com. Thank you.